The last day of the London Collections: Men shows coincided with the news of David Bowie's passing. As such an iconic figure in fashion, and one to emerge from British pop culture, it only made sense that he was honored at the quintessentially British Burberry presentation. Not only did classic Bowie tunes lead guests both in and out of the venue, makeup artist Wendy Rowe added Ziggy details of stardust-like glitter around models' eyes. 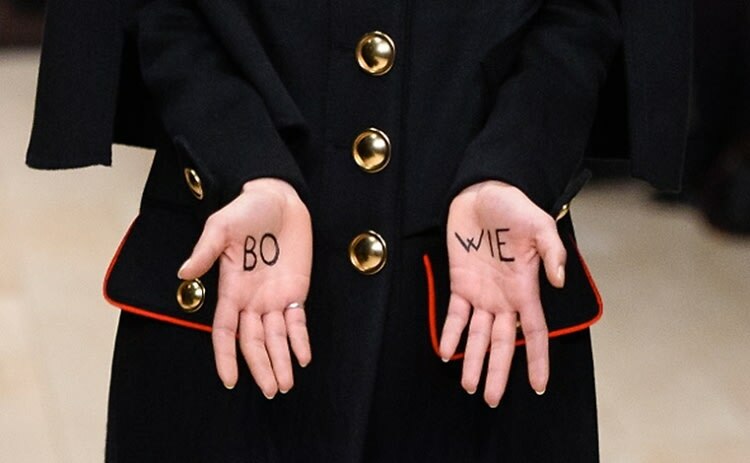 Though it wasn't officially sanctioned by the brand, the most poignant tribute was an impromptu shout out by model Hayett McCarthy who revealed the word "Bowie" written simply on her palms as she approached the photographer pit at the end of the runway. While models taking the initiative on the catwalk isn't always so welcome, it seems Christopher Bailey and Burberry were totally cool with it. When it comes to Bowie, anything goes. Click through for a look at the fall/winter 2016 men's collection.